Oh my word. These are amazing chocolates. If I may say so, quite humbly myself... What I think I love the most (well aside from the glorious taste) is the relaxed way you can make them. There's guidelines yes but no fixed rules. And that, I love. which makes you the chocolate. If you like it darker then use less lucuma and more cacao. If you like it really dark feel free to leave out the lucuma altogether. Experiment and play with both - if you like it darker follow the instructions above, sweeter pop more sweetener in etc, nuttier rocky road... you get the drift. Using a bain marie and minimal heat (you might have the hob on the lowest setting or just use boiling water in the pan under the bowl) slowly dissolve the cacao butter. Once fully melted add in the dry ingredients (cacao powder and lucuma) and mix well. Then add your choice of sweetener. Having recently discovered it in Unicorn in Manchester I went with date syrup and it worked a treat. Previous times I prefer maple to agave but check them all out and see what you like best. Mix thoroughly. 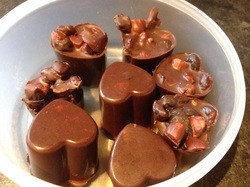 If you're making plain chocolates now is the time to add them to your mold. For the rocky road - add in the nuts, fruits (you could add in marshmallows too - I'm just about to order some vegan marshmallows for my daughter who loves them - these would be great albeit not raw but tasty all the same) and stir. Add to the chocolate molds, ensuring you've enough of the melted chocolate and not just choc coated nuts and berries in each serving. Pop them in the fridge for 30-40 minutes to set (or freezer for 20 minutes). Enjoy - and do let me know what you think!